Pratt Announces New Scholarship and Award Winners! SEATTLE, WASH – Pratt Fine Arts Center announced today the names of its 2016-17 Scholarship and Awards recipients. The awards provide educational and studio access opportunities for artists working in a variety artistic disciplines and at many different career levels. The ArtBridge Fellowship, thanks to the generous support from RBC Wealth Management, Chihuly Garden and Glass, and METHOD Gallery, fosters the creation and exhibition of new work from a promising talent, and equips that artist with the tools to advance to the next level in his/her professional journey.The Fellowship culminates with the production of a high-quality artist catalog and a solo exhibition at METHOD Gallery in the fall of 2017. MarkelUriu's work revolves around process-oriented pieces, in which she uses organic materials to create ephemeral narratives. Through this fellowship, Markel plans to unify her 2D and 3D work, expand her practice into printmaking, and further her professional training through Artist Trust’s EDGE program. The Edwin T. Pratt Scholarship aims to amplify the work of underrepresented artists of color and equip them with education and tools that will help them progress to the next level in their professional journeys. These artists, in turn, make powerful contributions to the cultural vitality of our region. Zorn Taylor works primarily in photography but plans to expand his repertoire by learning fine art and alternative printing methods. Zorn hopes his scholarship will help him to expand his visual arts practice by giving him access to serious technical trainingand dialogues about figurative work and portraiture. Asia Tail is a painter who aims to expand her practice through sculpture and installation. Asia is also looking to further refine her voice as a painter and experience the sense of community Pratt offers by working together with other artists. The Jon and Mary Shirley Scholarship in Glass is awarded to emerging artists who wish to pursue new or experimental directions in glass art. The scholarship is awarded to artists who demonstrate exceptional promise in the medium and whose past work and exhibition activities show strong potential and dedication to the glass arts. Through this scholarship, Tanner Clark plans to develop a body of work including mechanically themed sculptures that use the figure as a method for deciphering human emotions or social interactions. Tanner hopes that being at Pratt will inspire more cross pollination with other disciplines into his work. Jamie Randall will experiment with glass casting texture that focuses on the precision of small details. Jamie will apply his experience working in glass casting both at Pratt and as artist assistant to work on creative experiences that will take him outside his comfort level. Supported by the National Endowment for the Arts, the Professional Artist-in-ResidenceProgram provides established artists the opportunity to use Pratt’s specialized studios andexperienced artist assistants to explore new artistic endeavors during a month-long residency. As a part of the residency, the recipient is featured in a free public lecture and exhibits work at Pratt or a partner venue. Kelda Martensen plans to explore the way paper is physically altered by an artist and create a limited edition artist book composed of ten individual broadsides enclosed in a hand-made clamshell box. Each image broadside will be a combination of letterpress, monotype, relief and/or intaglio marks. The book will be exhibited in 2017 at Click!and at Grapheme Letterpress Studio. Offered in partnership with Seattle Print Arts (SPA), the Pratt/SPA Partners Grant provides opportunity for a printmaker who aims to refine skills or pursue new directions in the discipline. Michele Landsaat, a writer and illustrator whose work explores the symbolic world of the unconscious, will use the grant to explore etching as a medium, as well as experiment with its integration into her unique way of telling stories. Michele hopes that working at Pratt's print studio will allow her to move her stories from sketches to etchings to be shared with the publishing community and eventually readers. Offered in partnership with Seattle Metals Guild (SMG),the Pratt/SMG Partners Grant is designed to supporta metal artist who aims to refine skills or pursue new directions in the discipline. Through this grant, Anne Johnston will work to enhance her artistic development and metalsmithing skills, learning to set stones and solder metals other than brass and silver. Anne will also explore various finishing techniques to add color, pattern, texture, and depth to her pieces. Find images and more info on our winners on our website here. 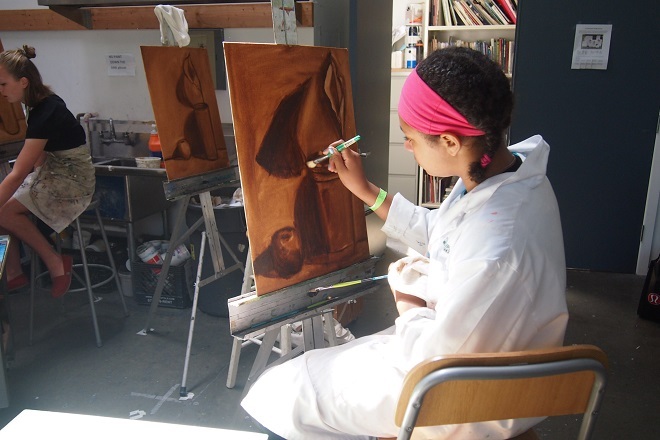 Pratt Fine Arts Center offers classes for all skill levels and abilities. It is the only facility in the Northwest where absolute beginners and established professional artists work side-by-side creating art in glass, sculpture, jewelry and metalsmithing, painting, drawing and printmaking. Pratt provides affordable studios with unparalleled state-of-the-art equipment and professional artist instruction to create an environment where students learn, experiment, and create.